While the sewing machine was out, I decided to sew up some double sided napkins. I had already cut these out and intended to use a rolled hem on them like I did with the handkerchiefs, but they languished in the work pile and gave me dirty looks periodically. Actually, I started out trying the hemming foot on my sewing machine. I did finally the swing of how to use the darn thing but I couldn’t make clean corners. The starts were always ugly and there wasn’t anywhere for me to hide it. 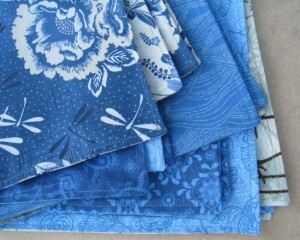 In any case, I now have a set of 5 napkins in assorted Japanese inspired cotton fabric. Perhaps I can now recycle some of my decades old store bought, and very stained, napkins.